We have a special treat for everyone today. 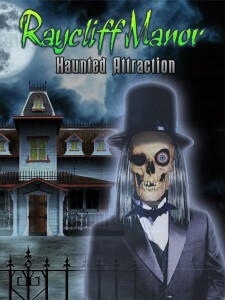 I just finished up an interview with Kelly Allen of Raycliff Manor and the author of So You Want To Be A Haunt Entrepreneur. If you have attended any of the haunt conventions its likely you may of heard Kelly speak but if you have not had the privilege then we have some great information he provides through the interview and if you have not read his book I suggest you head over and pick up a copy of it at HauntBook. Question One – What was your biggest challenge in starting your haunted house and how did you overcome it? Wow, this is a tough one because there are many challenges in getting started. One of the biggest though is securing a location! Our first year we actually had a location secured, so we thought, and when we went in to sign the contract for the use of the space, the terms of the contract had been completely changed. Some nights we were now being required to close by 10:00pm and we were being told that we could, on short notice, be asked to cancel nights of operation to allow for the theatre above us to operate without sound interference from our attraction. We were going to be leasing the basement space beneath the theatre. At any rate, we had to refuse the contract and scramble to secure an alternate location. We had already met with and gotten approval from the local officials for the theatre basement location and had to start over. We wound up securing a building at the county fairgrounds, which was in a much more remote location; however, we did wind up getting Raycliff Manor up and running and got the first year under our belts. Question Two – If you had one piece of advice to give to someone just starting out what would it be? I would have to respond to this question with two answers. 1. Before you waste a lot of time and energy, approach the city officials in the area you intend to operate your attraction and start developing a relationship early! Approach them as partners in the business and let them know that you are seeking their assistance in guaranteeing a safe show for your staff and the public. If you approach them as the enemy, they’ll respond in kind. If you are able to determine early on that they are not interested in supporting your attraction, you are better off seeking a new location than wasting time trying to fight the system. The building and fire officials have some liberty in interpreting and enforcing codes for haunted attractions. They can be your greatest ally or they can become your worst nightmare. Remember, their ultimate goal is to guarantee public safetyand to prevent liability to their departments/cities. Don’t approach them until you have a rough blueprint, one that can be altered and adapted to space requirements and requests from the officials, and a Safety Plan for your attraction operations. This is where you time is best spent in the beginning. 2. Don’t try to start to big! You can always improve and growas you build your audience. If your show isn’t huge and you’ve only been able to secure a smaller space, this can actually work to your advantage. You can spend less money on construction, set design, staffing, etc. You can always have a highly detailed and impressive smaller attraction in which you staff with very talented actors and provide a more theatrical experience that lasts just as long as the larger attractions people run straight through. Make your show original, especially of you are in an area with a lot of competition, and use as much sweat equity and help from your team to get your haunted attraction started. The number one reason a haunted attraction business fails is because of owners trying to be too big too fast and over-extending themselves financially. Question Three – What do you consider to be the most important aspect of running a haunted house and why? The most important aspect of running a haunted attraction is SAFETY! Like any business, individuals getting started can have a positive or a negative impact on the rest of their industry. The same is true of haunted attractions. Whether a charity or for-profit, the owners of a haunted attraction should have the safety of their guests and the safety of their team as a number one priority. As our industry grows and we are taken more seriously, we are working together with organizations like the National Fire and Protection Agency (NFPA) to ensure fair and reasonable safety codes and standards. Unsafe haunted attractions that experience injuries or deaths that could have been avoided inhibit this forward momentum and progress. Also, as a haunted attraction or any business owner, if you are ultimately responsible for a serious injury or death that was the result of negligence, you will then have to live with it. The dream will have become a nightmare. Question Four – What do you think is the key to running a successful haunted house? Attitude of gratitude! I mean attitude in regard to every aspect of your business. Most people don’t realize the amount of time, energy, blood, sweat and tears that go into the haunted attractions business. If, however, it truly is a passion, it will be a labor of love! As a haunt owner, it’s important to realize that you can have the largest “eye candy” props from the most expensive haunted attraction vendors, and you can have the most elaborate sets, sounds and lighting, but without an incredible team, you may as well can your business the “Haunted Museum”. Your Actors and Security will make or break the show. If you engage them in the development of your attraction and you empower them with “ownership” in their roles and a vested interest in the haunt, they will not let you down! Solicit the input of the team members and LISTEN! Many of the greatest ideas that have been incorporated into the Raycliff Attractions were suggestions made by the Raycliff Fright Team. If you develop a team, providing them a clear vision for the business and clear expectations for the individual team members, and you demonstrate your appreciation for their commitment and dedication, you will have a support system in place with a team of individuals that will share your passion and contribute to your success.